Send us your wedding photos to get a chance to be featured on our website! Beautiful wedding sparkler exit. Image submitted by Michele. Photo by Molly Joseph Photography, Charleston, South Carolina. Venue, Dunes West Country Club. Creates elegant wedding photos. Large sparklers are perfect for sparkler exit! Image submitted by Nicole. Include a sparkler send-off in your southern wedding. Image submitted by Michael from Hope Hull, Alabama. Add a sparkler exit to your California wedding. Wedding sparklers are a new trend for weddings. It creates breathtaking pictures. Our large wedding sparklers last for about 3 minutes. This allows your wedding photographer to capture the perfect picture. Draw a heart with sparklers to create your wedding photos. This is a creative way to include sparklers in photography. 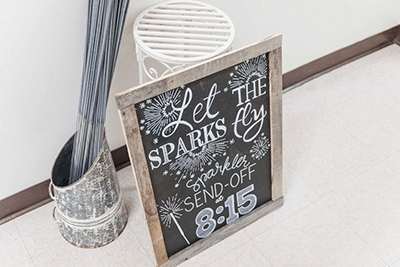 Create a beautiful wedding sparkler exit. Changing the colors to black & white creates a rustic and beautiful image. Light up the night with wedding sparklers. Create the perfect send-off! Figuring out what ideas you want to include in your wedding can be difficult. Adding a wedding sparklers exit is a new trend for weddings. It creates breathtaking pictures. Make your wedding day photos unforgettable with a sparkler send-off. Our brilliant gold sparklers will enhance your wedding photos with a one-of-a-kind effect that highlights your special day. We carry high quality wedding sparklers. Shop our premium wedding sparklers. We are a direct supplier of wedding sparklers. This allows us to provide the lowest prices for our customers. Our prices will help you stay on budget. We also offer free same day shipping on everything! Same day shipping applies on orders placed before 1:30pm EST. We want to help you add that extra flare to your wedding night or event. We carry premium products specifically designed for us. Our full time staff is dedicated to making ordering easy and efficient. We currently sell different lengths and shapes of wedding sparklers, #10 gold sparklers, #20 gold sparklers, #36 gold sparklers, and heart shaped sparklers. We recommend our #20 gold sparklers or #36 gold sparklers for a wedding sparkler exit. It allows the photographer more time to capture the perfect photo. Our #36 gold sparklers last on average 3 magical minutes. Our #20 gold sparklers last on average 90 seconds. The #10 gold sparklers and our heart shaped sparklers can be used as wedding favors. Visit size chart for more details. Before you purchase wedding sparklers, confirm with your wedding venue that they allow sparklers. Our sparklers are safe for everyone to enjoy. We recommend that children under the age of 12 have an adult present at all times when using sparklers.